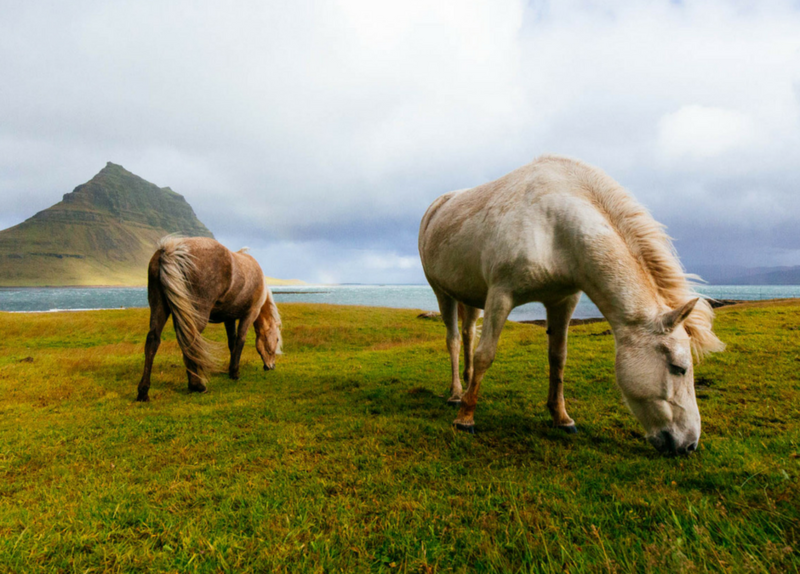 Horses are aware of their surroundings and have evolved to access nutrients from locations within their environment as they need them. Irrespective of where they may be located. Of necessity we have to keep horses in a restricted environment – hence they often need a mineral supplement. But why not manage your horse’s environment in a sustainable way that releases the nutrients they need from the soil? Grassland that has been fortunate enough to have lain undisturbed by the plough for decades will contain an abundance of soil microbes that will have stimulated the production of a naturally balanced ecosystem. The grass species feeding on this rich environment may well be unproductive and lacking vigour, but that is easy to rectify! Once the soil is ploughed, this fragile environment and the microbial profusion it contains will be annihilated and it takes many years to recover to the previous prolific state. That is not easy to rectify! Soil borne microorganisms are crucial for the fabrication of healthy productive plants. These bacteria and fungi have a symbiotic relationship with the plant that benefits both species. To function as a growing environment, the soil needs to contain 25% air and 25% water. The air is essential for microbial respiration and the water is essential to allow the dissolved nutrients to move from the soil into the plant root hairs. The bacteria stimulate the production of plant growth promoting hormones which rapidly boost the plants natural defence mechanisms. The boosted natural defence mechanisms will also generate a plant with a stronger constitution better able to withstand the vagaries of the British weather. The other significant benefit of this interaction is that the plant is also capable of utilising water more effectively so that it can distribute the absorbed nutrition up the plant. The crucial benefit of these bacteria is that they produce organic acids which break the chemical bonds that normally hold the nutrients (think magnetism) in the soil colloid. Once the bond is broken the nutrients are released from their bound state and are then freely available in the soil solution for the plant roots to absorb. Consequently, a healthy, well-fed plant is created. When a root grows it naturally generates an exudate (slime layer) on the outer surface. This exudate contains amino acids and sugars that the microbes feed on and use to produce protein and therefore grow. In exchange, the microbes release hydrogen ions which break the chemical bonds that hold the nutrients in the soil colloid. These nutrients can then be absorbed by the root hairs utilising osmosis. Once in the plant the nutrient filled water (sap) is distributed up the xylem tubes from the roots to the sites of utilisation within the plant. This process (Transpiration) is driven by the available potassium extracted from the soil once the microbes have released it. One of the most important groups of microbes necessary for highly productive soil plant interaction are the Arbuscular Mycorrhizal Fungi (AMF). This fungus naturally occupies ever greater areas of the soil adjoining the roots, as well as growing into the plant roots themselves. Consequently, the potential area for nutrient absorption is increased a hundredfold. During the years that the plants and microbes are left undisturbed to profuse then the greater this total colonised area becomes. Ultimately the environment becomes populated by self-sustaining soil flora and fauna that enrich their habitat to stimulate the generation of continuously productive grass. 1 Disturb the root-zone as little as possible and allow the soil to flourish. Don’t plough unless absolutely necessary: For instance, to incorporate organic matter. 2 Aerate the soil bi-annually with a chain-harrow or similar. Needless to say, the grassland needs to be firm and dry enough to travel on without damaging the sward. This activity will always be the most cost-effective sward management strategy ever undertaken as it removes some of the dead thatch and allows air back into the top soil. The other benefit of scratching the soil surface is that a chemical reaction occurs resulting in a small quantity of nitrogen being extracted from the atmosphere and placed directly into the root zone stimulating growth. 3 Incorporate appropriate grass species into the sward, and especially Sheep’s Fescue Festuca ovina. This is an extremely hardy native British species, which has developed the extraordinary ability to withstand challenging environments by growing its own mycorrhizal fungi. An innovative piece of evolution! Not only does it thrive, but the other grass species in the sward become healthier and more prolific because of this innovation. Just to recap on the key nutrients to balance the soil, and therefore the nutrition available in the grass. Magnesium regulates the uptake of Phosphorous; structural component of ribosomes; major constituent of chlorophyll production; and plays a crucial part in transforming sugar and starch within the plant to utilisable energy. Magnesium is also a crucial component of nerve and muscle function in all creatures. Hence animals that are short of this nutrient tend to be hyperactive and unpredictable. Calcium is an integral part of all cells, and the major constituent of the middle lamella which is formed during cell division. Obviously also required for bone development Calcium plays a significant role in muscle contractions, and a shortage will lead to cramp. In extreme cases the autonomous peristaltic function within the gut can stall, with dire consequences. Potash drives Transpiration The movement of dissolved nutrients in water (sap) up the plant to sites of utilisation. Potash applications will need balancing with regular applications of Magnesium to prevent Grass Tetany occurring. Grass Tetany occurs when the horse’s diet is too high in potassium which means that the extra cellular fluid is permanently high in potassium. This upsets the delicate sodium: potassium ratio and consequently the nerves and muscles cannot relax creating restless hyperactive animals that lack body condition and display a lack of ability to increase weight. I am often called out to investigate hyperactive horses that have become unpredictable and unresponsive, despite considerate handling. In the vast majority of cases that is because there is a lack of Calcium and Magnesium in the soil, which is exacerbated by an excess of Potassium in the grass they are eating. Hence the owners are feeding Calcium and Magnesium supplements to calm the horses down. Save money and create sustainable Happy Horses by allowing Lordington Park Agronomy to rebalance your soil.